How many calories in beer, and what is the quality of those calories? Will you get a “beer belly” by drinking beer? There are about 100 calories in a light beer and about 150 calories in a regular beer. By comparison there are also about 150 calories in a 12 fluid ounce root beer. You will not get a beer belly just from having one or two beers a day, but if you add more beer or more of any high calorie food you might grow some belly fat. In fact the same could be said for too much root beer or soft drink of any kind. Are these healthy calories? I know there is some evidence that a beer or two might reduce your risk of heart problems, but the alcohol has other effects that are not so good on the body. I do not know of anyone who would consider the calories in beer as healthy. 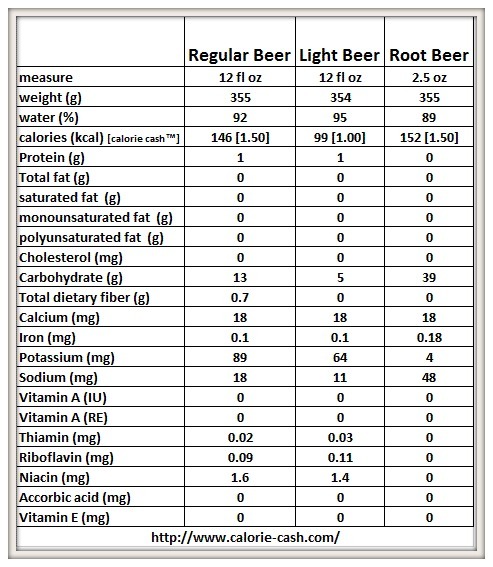 Likewise I do not know of anyone who thinks the calories in a root beer are healthy. As my mom who was a dietitian in WWII used to say: “All things in moderation.” This is especially true for beer and alcohol. If you find yourself drinking more than three 12 oz beers a day, why not try and cut back before it gets harder. My favorite way to get back on track is to give up alcohol for lent. Controlling how much alcohol you drink is a lot like controlling how many calories you consume. It is much easier to control your habits before they get too far out of control.